Shalom uvruchim haba-im to the Twenty-Ninth Learn Hebrew Pod Newsletter. 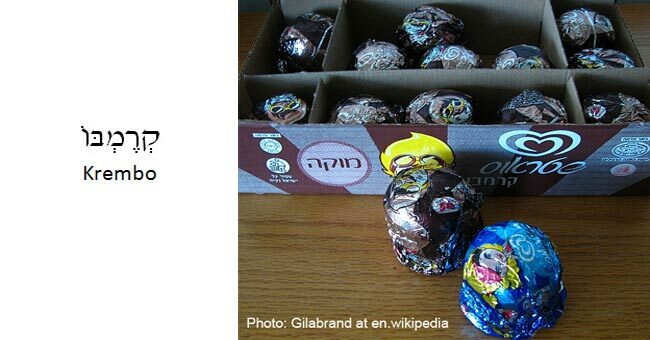 Though it actually originated in Denmark, the Krembo is another junk food that has achieved cultural icon status in Israel. It has a thin, round cookie base, topped by a big dollop of cream (either vanilla or mocha-flavored), all coated by a very thin layer of chocolate. (Look carefully... its Hebrew name literally means "cream-in-it.") Krembos are sold only in the winter, and Krembo season is actually only 4 months long--from October to February. But in this short time, 50 million Krembos are sold each year--an average of 9 per person in Israel. Want to see how Krembos are made? Check it out at http://www.youtube.com/watch?v=_usuhJc1hVc. kna-fe is an Arabic sweet made from sweet sheep’s milk or goat’s milk cheese, layered with fine shreds of pastry dough, and topped with a thick syrup (often colored orange). It’s served warm, and its deliciousness and calories are impossible to quantify! The Hebrew word beygale can actually mean a few different things: it can refer to a traditional bagel, or it can refer to pretzels of any shape and size. But many will tell you that the best thing it can refer to is an elongated oval-shaped bread, coated in sesame seeds. 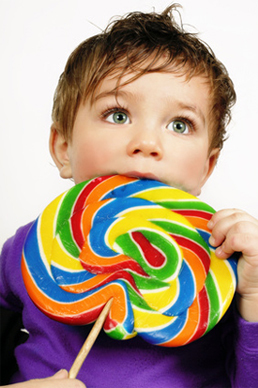 It's a little bit chewy, a tiny bit sweet, and a whole lot delicious! The best place to buy one (or six) is from a cart in or around the Old City of Jerusalem. Don't forget to ask the vendor for some zatar, a savory green spice for dipping. 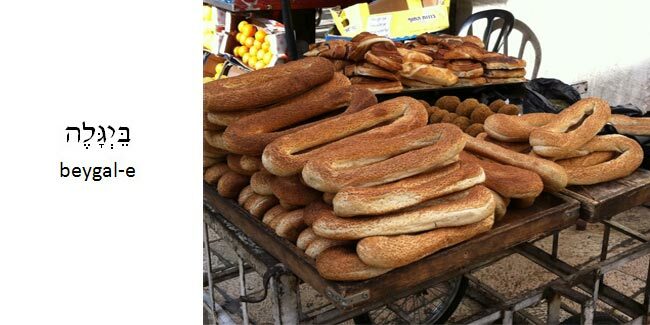 It is said that Iraqi Jews brought sabich to Israel, though its place of origin is not 100% known. It's served in a pita and contains fried eggplant, hard boiled eggs, hummus, tahini, Israeli salad, potato, parsley and amba ( a mango pickle). It really doesn't matter where it comes from... we sure know where it's going... yum!! Perhaps the most iconic Israeli food of all, the word falafel technically refers to just the fried little balls of ground chick peas. But just say “falafel,” and everyone knows it to mean the whole taste treat: served in a pita with salad, hummus, tahini, perhaps even french fries (“chips” in Hebrew), and maybe just a dash of some hot and spicy sauce. 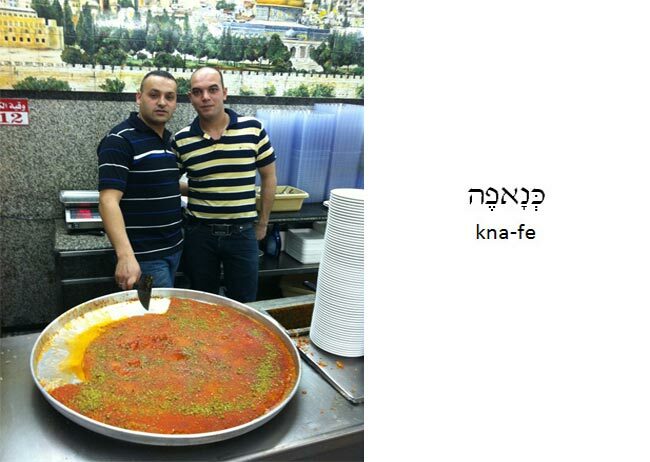 No doubt about it... it’s the true taste of Israel! 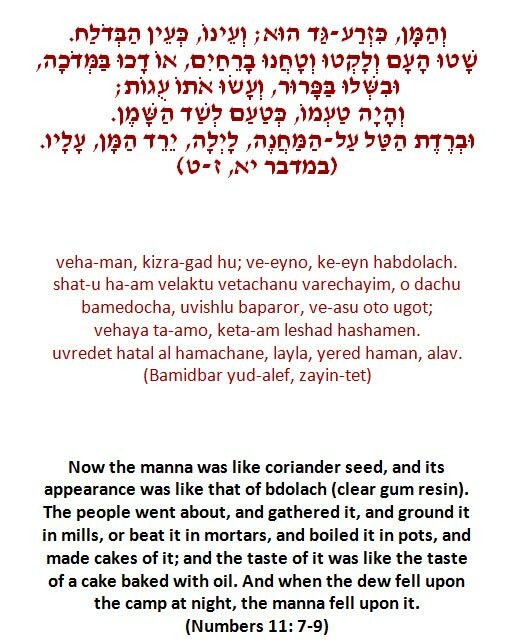 While the Bible doesn’t have much to say about junk food, it does tell us quite a bit about what might be considered the first staple of the Israeli diet... the manna the Israelites ate for 40 years while wandering in the desert. Actually, the Torah tells us that at one point, the Israelites became so tired of eating manna day in and day out, they complained about it quite bitterly. It certainly wasn’t junk food, but that didn’t stop them from griping to Moses that they were tired of eating this junk! It seems that one of Learn Hebrew Pod's teachers is crazy for rollercoasters. Can you guess who it is? Join us to find out... and to see if the others will be able to keep up! !